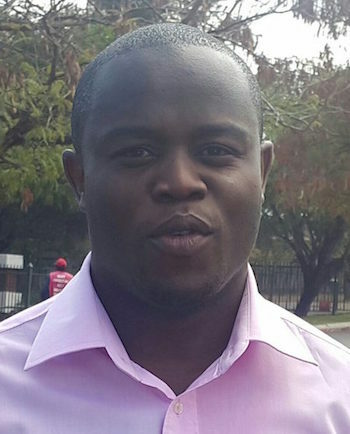 Promise Mkwananzi (31) has been active in the country’s civic society since his days when as a student leader at the University of Zimbabwe, as well as President of the Zimbabwe National Students Union. During that period Mkwananzi successfully organized efforts to pressure the government to scrap higher student fees as well as to safeguard students rights. But all this came at a prize as Mkwananzi was detained by the authorities who accused him of trying to influence rebellion within student circles. Upon leaving college, Mkwananzi has been a human rights defender and currently is the Director of the Zimbabwe Informal Sector Organisation (ZISO) a nonpartisan body that promotes and safeguards the interests of the millions of Zimbabweans who work in the so-called “informal” sector of the country’s economy, many of them in small business and farming operations. According to Mkwanazi ZISO has been instrumental in assisting workers in the informal sector access lines of credit as well as other useful tools that improve their work. “ZISO has assisted thousands of workers in the country as we have mobilized resources necessary for the growth of their businesses. “We are also into training in workers rights and this has been very helpful since a lot of workers in the informal sector have benefited,” said Mkwanazi. ZISO has also organized anti-corruption trainings for its members as well as educating them on constitutional rights related issues. Zimbabwe’s economy is heavily centered on the informal sector as a majority of bigger companies have closed shop as a result of the decaying economic situation.